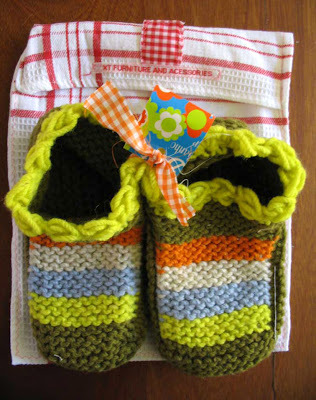 These knitted wool slippers made by XT Handmade in Portugal arrived in the post this week, sweetly nestled in a little bag made of a dishcloth. I love the colours and the stitched-on rubber soles. They’re the perfect indoorsy, cosy (shloompy?) thing to wear during this icy weather we’ve been having. Check out more handmade lovely things in the XT Etsy shop. Very nicely made, and the choice of colors is pretty. Using a dishtowel to make a bag is beyond cute!